Today’s blog was written by a guest blogger, Luke Larson. A tremendous thanks to Luke of Larson Carpentry for sharing this with us – not only his pictures and story, but his talent with wood. 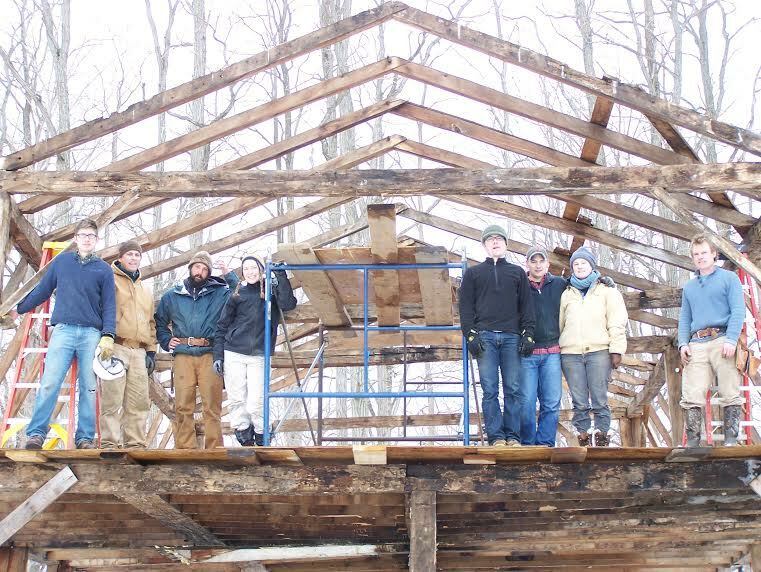 Luke and his crew recently dismantled the Gambrel style timber frame which I wrote about earlier in the winter. You can read more about the English Gambrel style home, which was built in the 1790s, in my blog here. 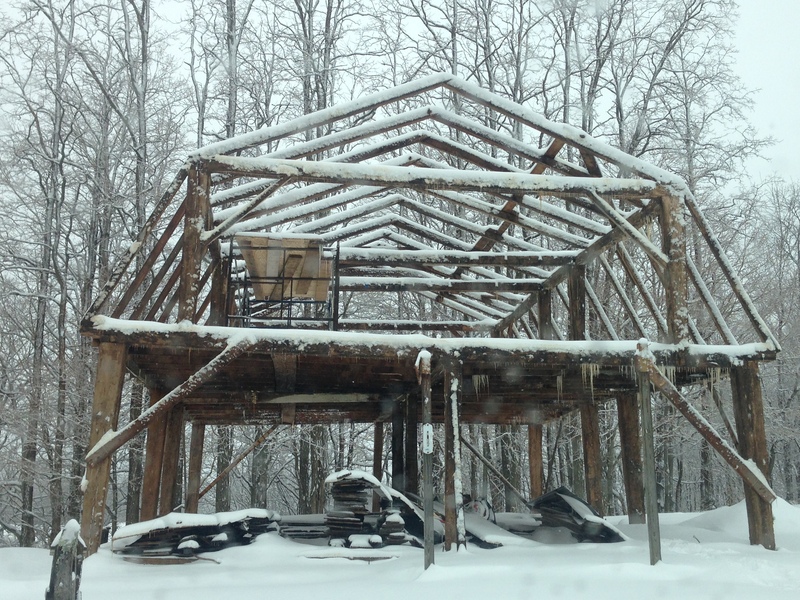 This beautiful vintage timber frame is looking for a new owner. Interested in calling this frame home? Contact us! When we first began inspecting this home back in the fall, we were guessing it was built in the 1820s. 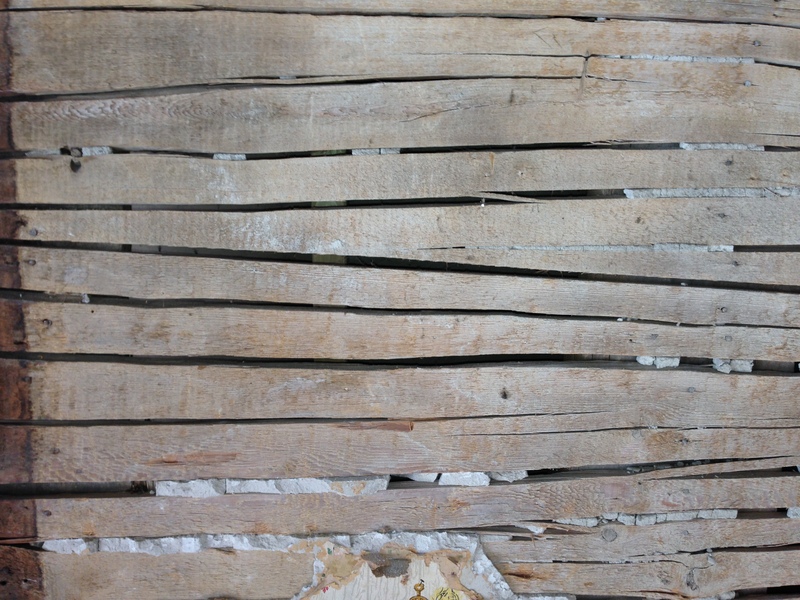 Throughout the process of gutting the house down to the original ingredients, we have made the exciting discovery that it is an earlier timber frame, built in the 1790s! We also discovered that the house is featured in a Vermont architectural survey, described as an early and rare example of craftsmanship. 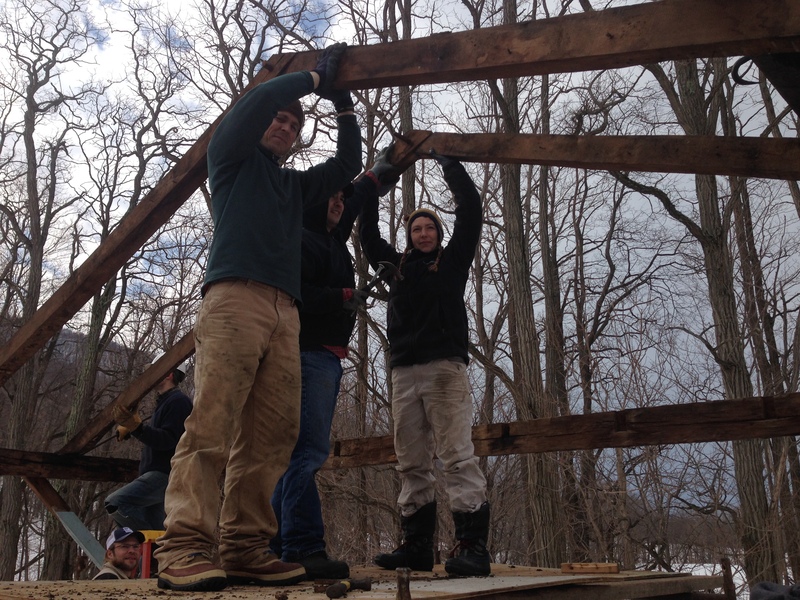 The frame size is 28 x 38 feet and the stout timbers are made out of American chestnut, beech and white oak wood. 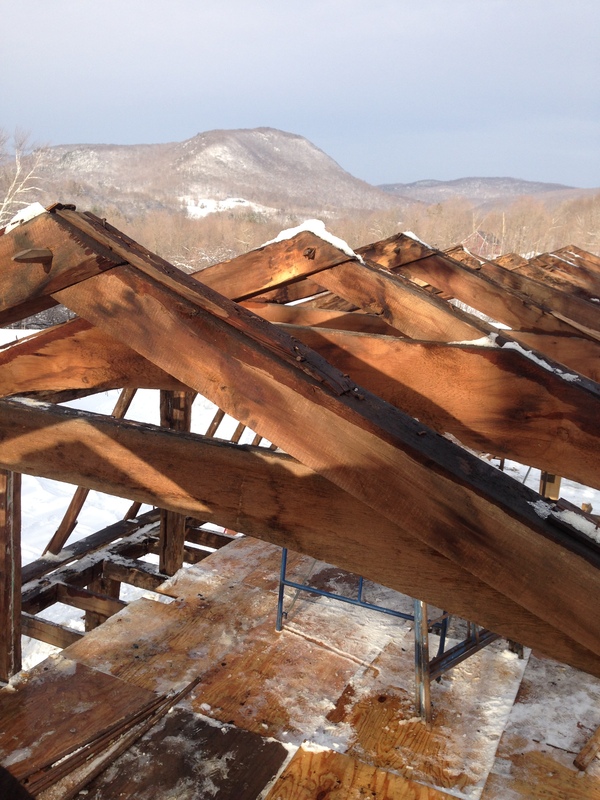 The main beams are hand hewn while some of the floor joists and the rafters are water sawn. These were likely crafted at a river mill within a few miles of the site. “Gambrel” refers to the double pitched roof seen above. 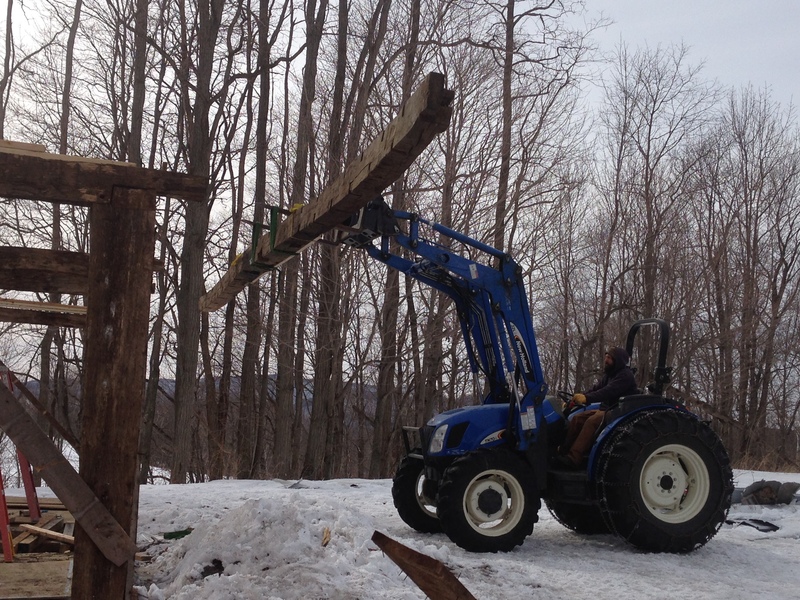 It is a style that is uncommon here in Vermont. One of the major benefits is the wide open and spacious feeling of the second floor. There is a 22 X 38 foot clear space in the center. With the uncommon arches collar ties on the back half, this will make a remarkable master bedroom! The posts on both floors are gunstock, meaning that they get larger at the top and make for exceptionally strong timber frame joints. I had a great crew of 10 for the day we lowered the frame to the ground. 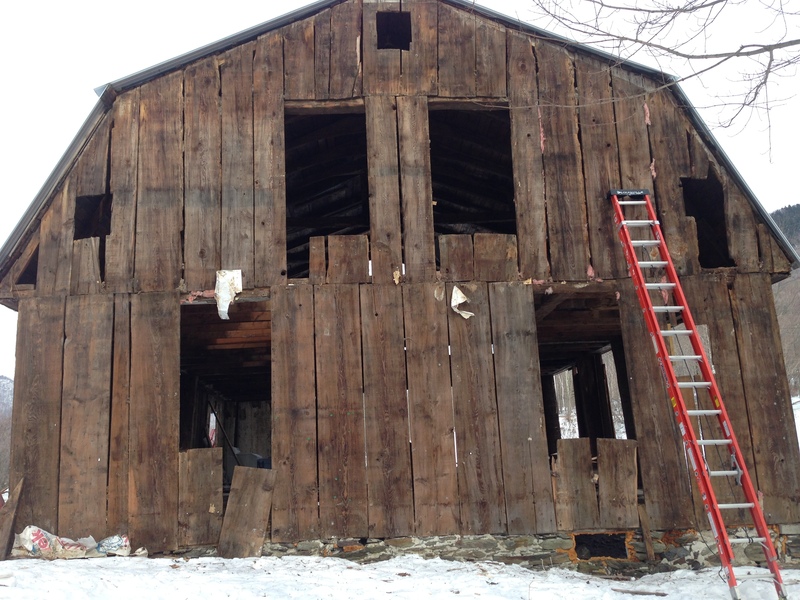 It is an amazing thing to remove the oak pegs that have been holding the building together for the past two hundred plus years. And it is amazing to be learning my craft from master builders who lived more than two hundred years ago. Every piece of this house is now labeled and carefully stored away. Beautiful Joinery on New England Frame. Note the arched collar ties! Let’s return to the detective-like task of uncovering the date the house was constructed. After about 500 hours of tearing out additions, sheet rock, wiring and insulation, we were finally able to get a better look at the original ingredients. 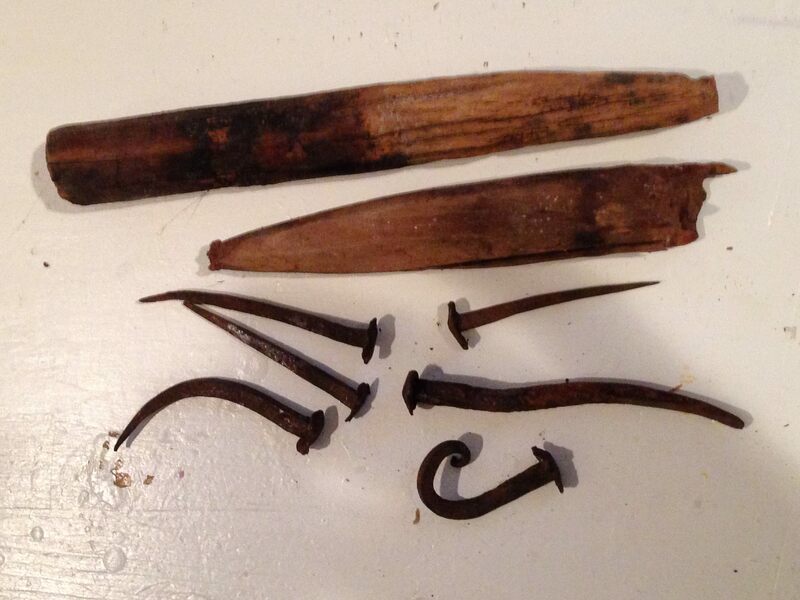 A major clue as to the date of the house came from the nails used. Most were rose head nails, meaning they were formed completely by hand with a forge. The term “rose head” comes from the beautiful shape of the nail head, which was pounded out with four quick strokes of the blacksmith’s hammer. Some cut nails (made by machine) were also used on this house, primarily on the flooring. It was exciting to discover that these cut nails were of the earliest variety, as evidenced by the way the metal sheets from which the nails were cut had to be flipped over during the process, creating a slight metal bur on opposite sides of the nail. Only a few years later, the technology had developed enough that the nails were “stamped out” of sheet metal without needing to be flipped over, creating a different bur pattern. The earliest machine-made nails still had the heads fine-tuned by hand, but with only two strokes of the hammer. It was a very narrow window of time during which these nails were made and it helped provide the time frame for this home’s construction. Another clue in the dating process involved the plaster and lathe. Very early homes such as this one used split board lathe to hold horsehair plaster to the wall. It was made by chopping a wide board with a hatched, thus stretching it apart like an accordion. This was then nailed to the wall. As sawing became more economical during the early 1800s, later home builders used narrow lathe that was sawn rather than split. 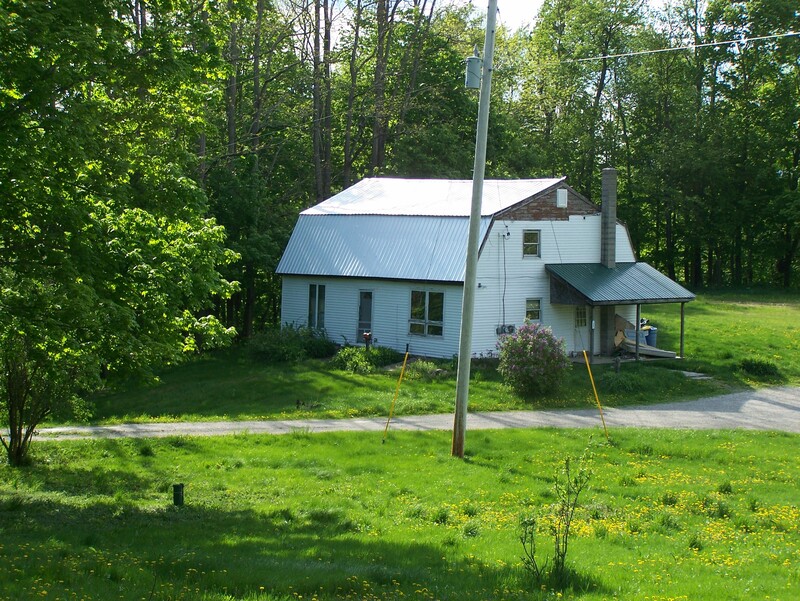 This house had accordion lathe throughout, as the next photo shows. This picture is just one wide board that has been cut and spread apart. Original Siding – up to 22 inches wide! 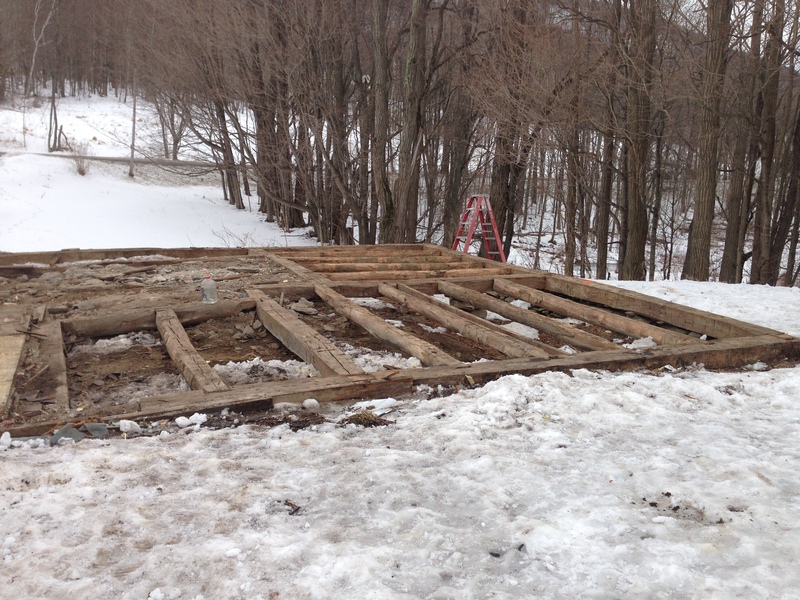 The boards you see above are one and a quarter-inch thick hemlock planks. Many are over twenty inches wide! Imagine the trees that the boards came from! At this stage in the process, I was able to discover all of the original window and door layout, which I have carefully documented. Notice the tiny windows out in the eves. These would have allowed light into the area right under the rafters. Here is some of the amazing joinery. In the picture above, you can see the end of a summer beam, meaning a beam that runs mid-span and supports floor joists. This joint is “dovetailed,” meaning the joint is made in such a way that it cannot physically pull apart. Finally, we were down to the first floor after the upper structure was down. Once the beautiful wide flooring boards were removed and saved, I labeled each of these sills and floor joists. Even without a foundation, the rot-resistant tendency of American Chestnut means that many of these sills are still in great shape and ready to be used again! It was a pleasure working on dismantling this frame and I enjoyed uncovering details at each step along the way! Below are a few more of my favorite photographs from the dismantling process. In may ways, it was both a joyful and sobering task to take this houses down. There were many poignant moments when I thought about all of the living that has taken place in this space, all of the generations and families that have called this building home. My hope is that the time-darkened timbers and patina laden boards of this house will again be someone’s home. 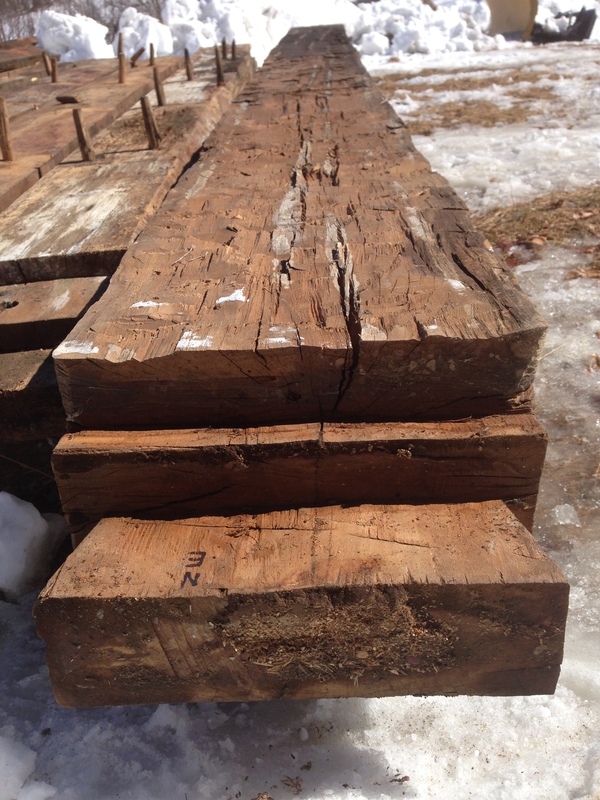 I intend to honor both the craftsman who chopped these beams from the forest as well as all those who have cared for it since as I embark upon my next step: the restoration of this beautiful timber frame. 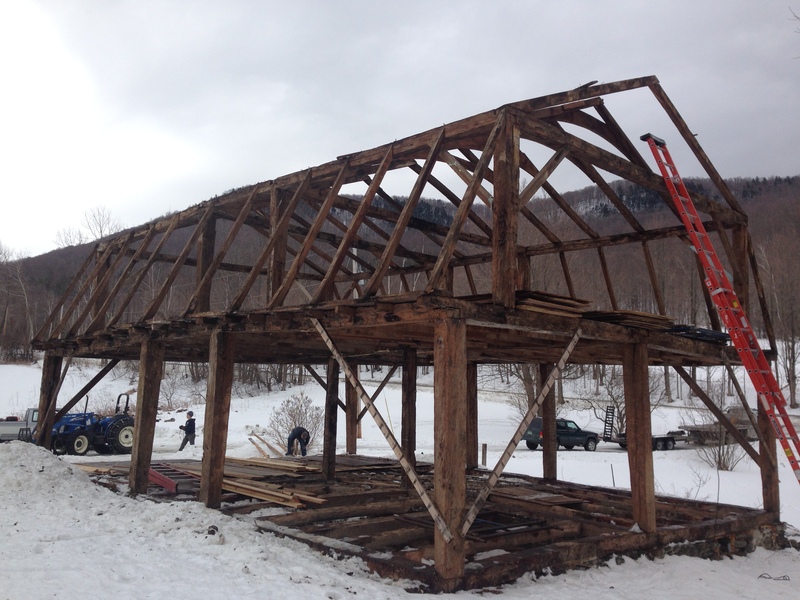 Please contact Green Mountain Timber Frames to learn about the vintage timber frames we have available – or to share your own story about barn restoration! We welcome guest blogs! This entry was posted in Frames in stock, Green Mountain Timber Frames, Guest Blog, Post and Beam, Timber Frame Projects and tagged American heritage, available barn frames, barn for sale, barn frames, barn homes, barn style homes, gambrel roof, historic barn, historic post and beam homes, historic properties, Historical New England, timber frame vermont, timber frames, vermont timberframes by Green Mountain Timber Frames. Bookmark the permalink.